All transactions are safe and secure with a reliable history in online purchasing behind each of our associates. 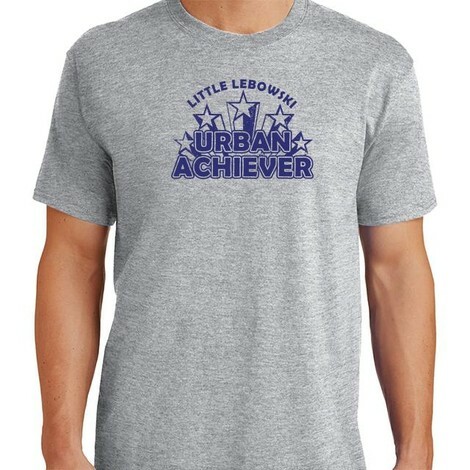 Buy the Little Lebowski Urban Achievers t-shirt to own Big Lebowski clothing and merchandise. The fronts of these Big Lebowski t-shirts let everyone know that you are a Little Lebowski Urban Achiever, or a child of promise without the necessary means for a higher education. The design refers to the family run charity of Jeffrey Lebowski, the seemingly wealthy businessman who The Dude is mistaken for. Wear this Little Lebowski Urban Achiever t-shirt to let everyone know that you were given a second chance. In addition to the Little Lebowski Urban Achievers tee above, browse the Big Lebowski Clothing Gallery for more apparel like men's and women's clothes, kids shirts or hoodies.